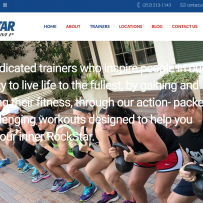 RockStar Fit Camp - Collective IT Solutions, Inc.
We found some great Workout templates to utilize. The client wanted many changes to the defaults, but it always helps to start with a template to save time and money. We used many of the features, but added some awesome plugins to give the client even more! An awesome Locations feature is included to help clients find all locations!